Originally, a Moorish fortress existed on this site. During the Christian reconquest of Spain, Ferdinand III established a camp here before his taking of Sevilla. At the end of the 13th century, the estate was acquired by Queen Mar’a de Molina. She transformed the property from a military structure into a Renaissance-style hacienda, a design that was copied in the area. I think it’s essential to have your own transportation here. There isn’t much of interest in the immediate area, but the estate makes a good base from which to explore the greater region. Parking is free and easy, and you don’t have to worry about your car. The hotel has reception facilities for hundreds of people. You might want to check upon reserving if any large parties or weddings are planned during your stay. Rates do not include breakfast or tax. The estate is 12 km north of Sevilla. From Sevilla, take route SE-30 toward Mérida and “Algaba.” The hotel is not signposted and is marked by a small plaque. Try to arrive during daylight hours and look for a large white and yellow estate on the left. 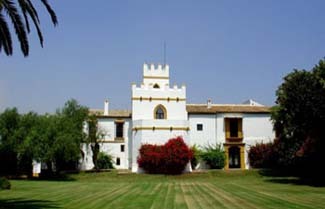 This romantic and unique Andalucian estate consists of several buildings. A 12th-century fortress is adjacent to the main Renaissance building and may be explored. A former barn has been converted into an inviting living room that is beautifully decorated with original 17th-century Flemish paintings. It’s a perfect place to curl up with a book in front of the fireplace in the winter months. The gardens of the estate, copied after those of the Alhambra in Granada, are outstanding. Moorish-style irrigation canals and fountains are cool and soothing. Trees and plants abound. A small restaurant provides well prepared meals. The attentive and friendly staff are more than helpful in providing information on how to best enjoy your stay. The estate is a Spanish National Monument.